The Breakdown: Do Presidential Speeches Matter? Ever since his breakthrough keynote at the 2004 DNC, Barack Obama has been defined by his oratory skills. But has his rhetoric really advanced his policy goals? On this week's edition of The Breakdown, Chris Hayes talks to political scientist George C. Edwards III about the impact presidential speeches have on public opinion and political change. Ever since his breakthrough keynote speech at the 2004 Democratic National Convention, Barack Obama has been defined by his oratory skills. For many of the major issues of his presidency, health care reform for example, Obama has turned to major speeches to help shape public opinion. But with legislative disappointments like inaction on climate change and seeming impotence to halt BP's oil spill piling up, many on the left are starting to question whether the president is doing enough to advance his agenda. 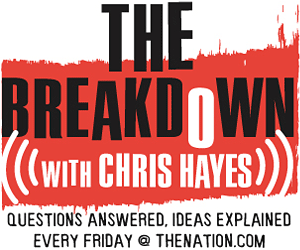 On this week's edition of The Breakdown, The Nation's Washington Editor Christopher Hayes talks to political scientist George C. Edwards III about what impact, if any, presidential rhetoric has on public opinion and political change. Ever since his breakthrough keynote speech at the 2004 Democratic National Convention, Barack Obama has been defined by his oratory skills. For many of the major issues of his presidency, health care reform for example, Obama has turned to major speeches to help shape public opinion. But with legislative disappointments like inaction on climate change and seeming impotence to halt BP’s oil spill piling up, many on the left are starting to question whether the president is doing enough to advance his agenda. On this week’s edition of The Breakdown, The Nation‘s Washington Editor Christopher Hayes talks to political scientist George C. Edwards III about what impact, if any, presidential rhetoric has on public opinion and political change. More information on Professor Edwards. Note: This episode of The Breakdown originally aired July 9. New episodes will return September 10.